The greatest rock n roll frontman ever finally gets the Lego treatment thanks to a diehard fan. The resulting sculpture captures Freddie’s most iconic stance onstage when he still rocked a fearsome mustache that out-machoed the beardiest macho men anywhere (here’s looking at you Chuck Norris). While the sculpture isn’t big on detail, it perfectly captures the exuberance and sheer power of Freddie Mercury in his prime. It was truly a blow to all Queen fans and the music world when he passed away 20 years ago. Along with Isaac Asimov (he got infected via a botched medical operation), Freddie is another timeless figure laid low by AIDS. 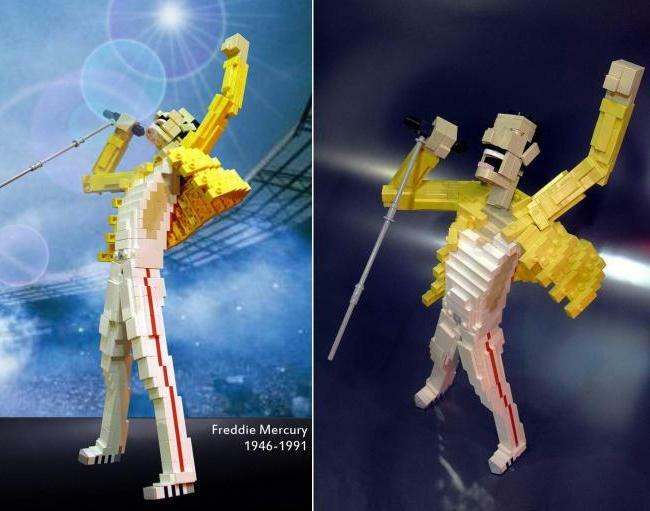 The statue above commemorates Freddie during Queen’s timeless Wembley Stadium performance, complete with yellow jacket, striped trousers, and the shortened mic stand he’s always wielding. Let the comments section downstairs be a receptacle for all your Freddie/Queen love.